Thomas Gravesen has been left out of Real Madrid's squad to tour the USA. The news is likely to increase speculation that the 30-year-old Denmark international is lining up a return to the Premiership. 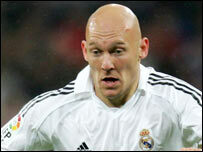 Gravesen joined Real from Everton in January 2005, but has struggled to establish himself in the first team. He future was further thrown into doubt after he was involved in a fracas with team-mate Robinho during Real's pre-season tour of Austria. Gravesen's agent John Sivebaek told BBC Sport last week that Real wanted to sell the player - and said Gravesen would be happy to return to the Premiership. New Madrid coach Fabio Capello's decision to recruit Brazil midfielder Emerson from his former club Juventus has meant that that the Dane is now viewed as surplus to requirements. Madrid have also left defender Carlos Diogo out of their tour of the United States where they will play DC United and Real Salt Lake three days later. Right back Diogo joined Real from River Plate last July, but with competition from Michel Salgado and the subsequent arrival of Brazil international Cicinho he was unable to earn himself a place in the starting line-up. Real's new signings Fabio Cannavaro, Emerson and Ruud van Nistelrooy have all been included in the 24-strong squad for the US tour. But Brazil striker Ronaldo and midfielder Guti will remain in Madrid to continue their recovery from injury.